It’s all too easy to style yourself into a cul-de-sac. You buy clothes for work, then start wearing them on the weekend because they’re suddenly the nicest things you own. They become the filter for new purchases, with each potential addition to your wardrobe weighed up according to whether it chimes with that blazer you like, those chinos you wear so much. That aesthetic slowly consumes everything else, until it's your only option. Every time you open your wardrobe, you’re greeted by nothing but office clothes and the gentle whiff of disappointment. 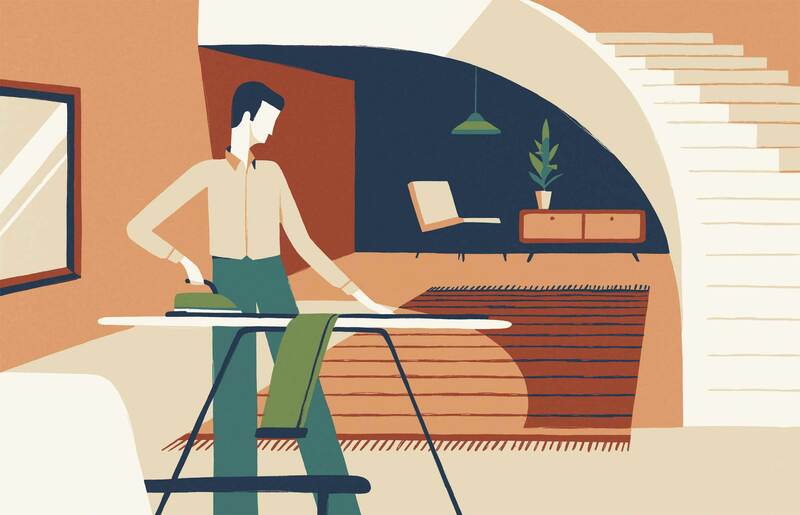 I suffered this fate a few years ago, when I found myself working as a writing drone in an office with an unspoken but clearly defined dress code; the smarter side of smart-casual, blazer and open-collar shirt, chinos ideally, but perhaps very dark jeans if you woke up in a particularly mellow mood. The shoes were all as shiny as the palette was drab, the navy, beige and cream of a show home. This made for a limited set of options. Dressing was safe, it was easy, because everything worked together. But it was boring. There was none of that sense of excitement you get when you wear clothes that feel like they’ve got your personality woven into the fabric. Until the day I discovered an out. A transitional step, from this wardrobe to the next, which would let me evolve my style without throwing away the clothes I’d lovingly collected up to then, or lose the confidence that came from wearing things that I knew worked. It was a shoe, plain white and as sleek as the brogues I lived in at the time. Trainers, I thought, were bulky, obnoxious, attention-seeking things, for children and sportsmen. But it turned out that they could be refined, too. 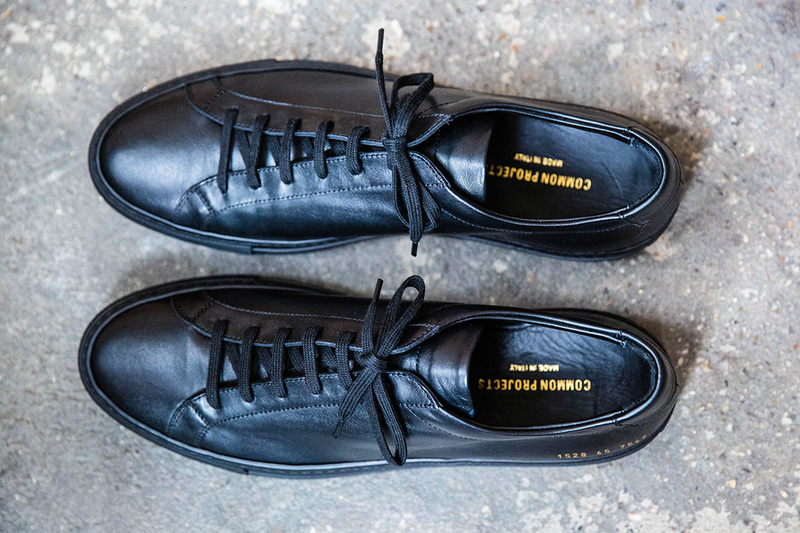 The Common Projects Achilles, a whisper of a shoe, the kind of footwear you imagined had its own villa on the Mediterranean. Problem was, they were also awfully steep for a style swerve that might not stick. 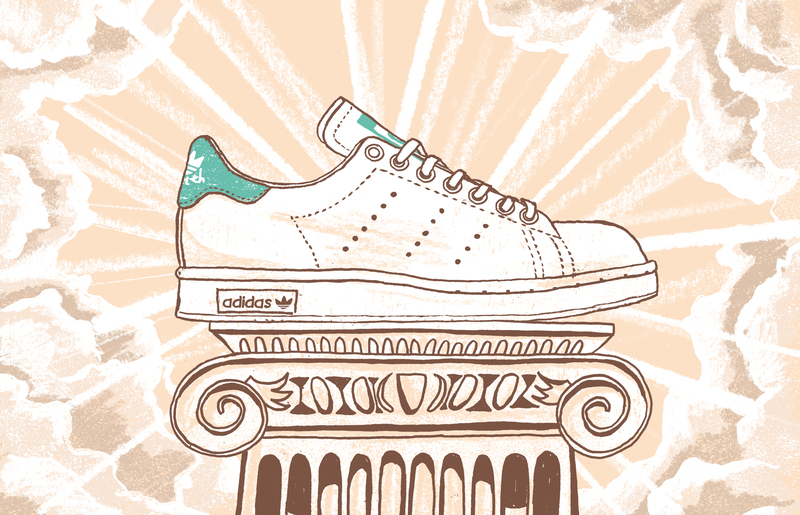 Which is when, into my life, came the adidas Stan Smith. The definition of minimalism, the style began life as a tennis shoe – typical, since tennis must be one of the only sports with a dress code, not a strip. Though part of the adidas arsenal since the 60s, the brand renamed the style in 1973 for the then world number one, after which it became a go-to for everyone from hip-hop b-boys to skaters to football casuals. But these were all off-duty environments, men at leisure who needed shoes that were stylish and comfortable, but not smart. Until smart began to lose its caché. 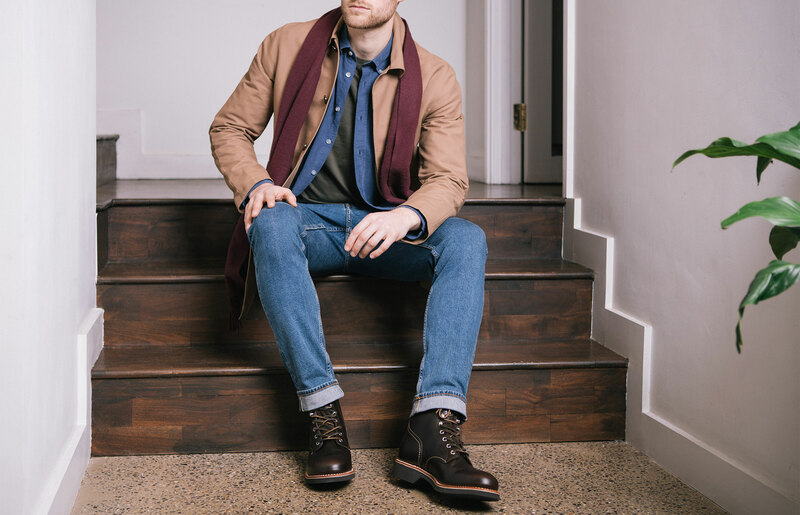 I discovered these shoes just as men’s wardrobes were just starting to change, suits fading away as the world’s wealthiest men turned up to their office in hoodies and jeans. Expectations were gradually eroding and the acceptance grew that you didn’t have to dress like your father to excel at your job. So, an experiment; these minimalist trainers to work, with slim-fit chinos and the most relaxed blazer I could find. They raised eyebrows. Received comments. But they also revealed possibility. My wardrobe, suddenly, wasn’t a straitjacket; it was a sea of options, of choice and variety and, most excitingly, of contrast. The shoes that, really, weren’t so far removed from what I’d worn before showed me that you can take something classic and reimagine it, consider it from a different angle and discover how, with some clever juxtaposition, it could suddenly look new. Those Stan Smiths were a gateway to introduce other things – a mustard fisherman’s knit, a pair of deep brown cords, a double-breasted overcoat that reached below the knee and swished so satisfyingly – that never felt far out, but always took my sense of style a touch further. Most importantly, they proved to me that a wardrobe should evolve. Clothes are not static items. You shouldn’t repeat looks to the point of tedium just because you know they work. Something new, or something old worn in a new way, can change your mood, your outlook on life, your career, even. A year after making that step I was interviewing for a new job, a real writing job on a real magazine, when the editor commented on my shoes. He showed me his. We talked about what they meant to us, the way they made us feel. And, two days, I got an offer. Can a pair of shoes change your life? Perhaps. That career change can’t have been purely down to what I was wearing. But without the energy they’d given me, I probably wouldn’t have been in his office in the first place. With my first pay cheque, I treated myself to those Common Projects. But I still don't love them as much as those Stan Smiths.